The JTR-1102-RS is part of the Performance Series from Jupiter, and designed give provide the utmost in tone and response. This medium weight trumpet is made from silver-plated yellow brass, it features a Custom B1 bead 4.8" rose brass bell and a .460" bore. The 1102-RS has a standard leadpipe and Monel piston valves. It has a 1st valve slide thumb saddle and a 3rd valve slide throw ring and stop. 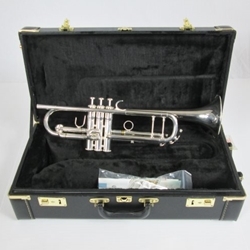 This particular trumpet is on consignment at our shop. It has been chemflushed and polished and is ready to play!